Most cars now have a Satnav fitted, so I thought you might like the postcode for this church. The first Anglican Church in Hook was built in 1886. It was known as the Tin Church and stood on the corner of Elms Road and London Road, and was used until 1938, when a more permanent building was built. Originally St John's was not a Parish Church, as the church in Hook was technically a Chapel of Ease for the Parish of Newnham. Hook became a Parish in 1955, and in 2005 became part of the Benefice of Hook and Heckfield with Mattingley and Rotherwick, which is now called the Whitewater Benefice. St John the Evangelist in 1931 Edward Maufe had been commissioned to design a Church for Hook. In 1932 he entered and won the competition to design Guildford Cathedral, so it is not surprising that there are many similarities between St John's and Guildford Cathedral. The foundation stone was laid on the 30 December 1937 by Colonel F G Barker who had given the land for the Church. The builders were Messrs W H Musselwhite & Son Ltd of Basingstoke who used local bricks for the building, and many of the headers are purple/blue to give a special decorative effect. The cost of the project was £36,000. 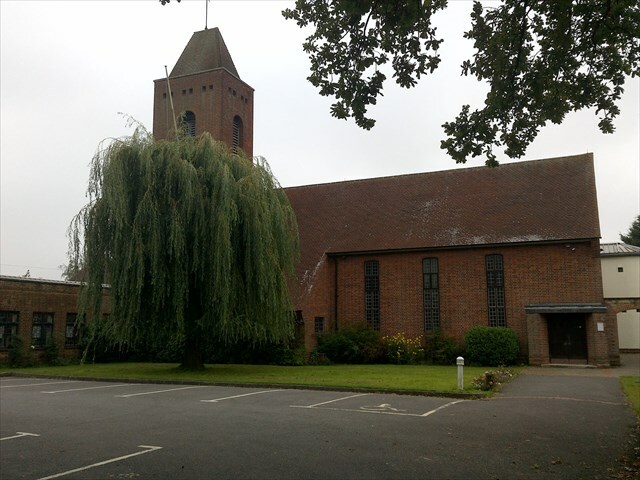 The completed building was consecrated by the Bishop of Winchester, Cyril Garbett, on the 20th June 1938, six months after the laying of the foundation stone. The Church premises were extended in the early 1990s, with a large new centre added south of the nave. Work was finished in 1992 when the Bishop of Winchester, Colin James, came to dedicate it and to consecrate the Lady Chapel. The architects were Plinke, Leaman and Browning from Winchester, and the builders were Collier and Catley from Reading. Please make sure it is well hidden before you leave.